With all of that being said, it is also the day when you will be judged for every decision that was made to make the wedding happen. There will be lots of pressure and you will definitely feel a bit anxious as you work with your friends and family to make the day fabulous. So, the last thing that you want to worry about is whether or not your hair is perfectly coiffed. Your makeup and whatever you decide to wear for your wedding day are important. But, your hair...that is the ultimate piece in the whole affair. Your hair will be ever-present and it will likely appear in almost all of the pictures from your wedding day. That’s why it has to be perfection incarnate...and it can be. Whether you are going for an ethereal goddess hairstyle or an updo with tendrils framing your face, you want your hair to be the best that it’s ever been. You can achieve the optimal look by having your stylist incorporate top quality hair extensions into your big day. To find more about top quality hair extensions you can visit EH Hair Extensions official website. The results are sure to be phenomenal! With hair extensions, you can, literally, wear any style that you can dare to dream! 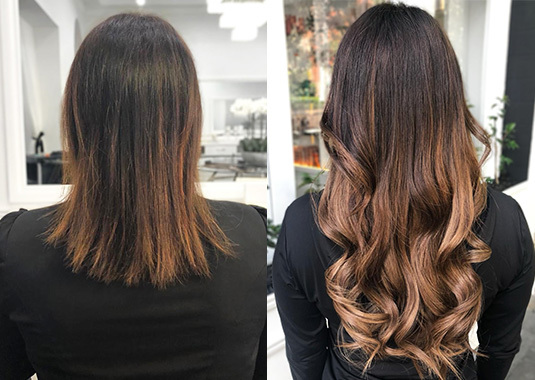 Hair extensions come in a wide variety of textures, an array of hues to compliment your current hair color or to give a completely different look, and of course, more length options than you realized even existed. There is something liberating about knowing that your hair will be exactly as you want it when you say, “I Do”. You will get fuller, more voluminous hair when you incorporate hair extensions into your wedding day hairstyle. The hair extensions will help to create a fabulous hairdo and you will feel confident that you are projecting your best look. It can be difficult to get the right look when your natural hair is thin, uneven, or just not enough for the style that you want. The hair extensions eliminate that issue and that becomes one less thing that you have to stress over because you can be assured that your hair will be impeccably done. One of the best things about hair extensions is that they are a temporary style solution. Unlike your future husband, you don’t make a vow to the hair extensions and you can get rid of them at any time. Knowing that, you can be more daring with your hair style. Trying a new look on your wedding day may be a great idea as you enter a new phase in your life.